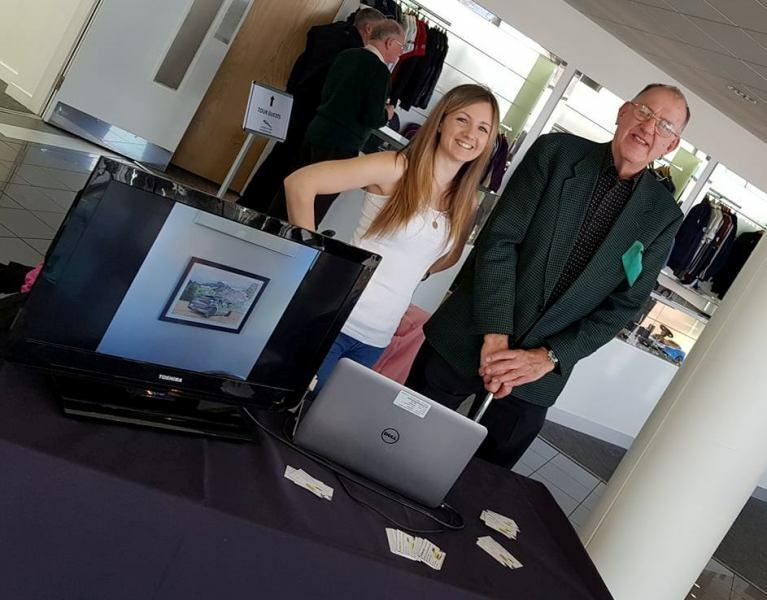 This year the lecture took place on Sunday 26th November 2017 at the usual venue, The Jaguar Visitor Centre in Castle Bromwich, where Bob Beecham has organized and hosted this event for many years with the assistance of fellow JDC members. I always look forward to, and enjoy the AWML, and come away on a high – wonderful company, lovely atmosphere and inspirational speakers! This year, however, I came away from the event on a higher high than normal! As Rob and I arrived, we were greeted by the event host, Bob Beecham, and very soon we were chatting with Norman Dewis, Trevor Groom, Nigel Webb, Peter Wilson, John Burton, Michael Byng, Andrew Jeffery, John Butterworth, Michael Quinn and Michael Driver – these are some of the people who helped to build the Jaguar legend and who continue to maintain it. Among these people is Stuart Spencer who, completely to my surprise, presented me with number 149 of his stunning limited edition of 500 prints of one of his original drawings depicting the Jaguar XJ220, signed by John Egan and Jim Randle, with the dedication ‘To Letitia with best wishes’ and signed by Stuart himself. A gesture such as this deserves to be recorded, so Rob took a photo of the artist, Stuart Spencer, while Norman and I held the picture open. 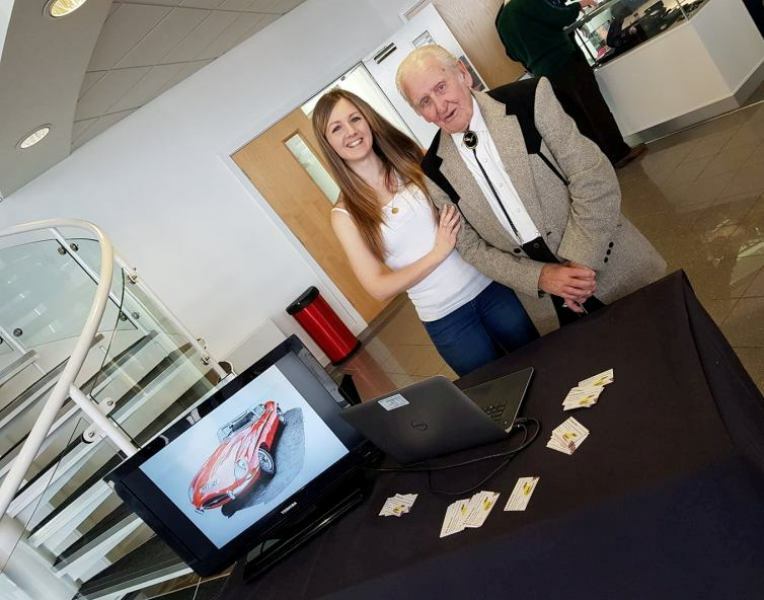 My eldest daughter, Jaguar engineer and part-time automotive artist was also present – she took a few commissions on the day and donated a commission for the event charity, raising £310 – the winning bidder being John Butterworth, owner of an impressive collection of 18 cars which include an XJ220, Mark 7 and a Ferrari. Aside from the picture he bid on, John is going to commission drawings of his entire collection, which should keep Esta-jane busy for some time! Bob Beecham takes the stand at The Jaguar Visitor Centre and introduces the speakers and chosen charity for this year’s Andrew Whyte Memorial Lecture. 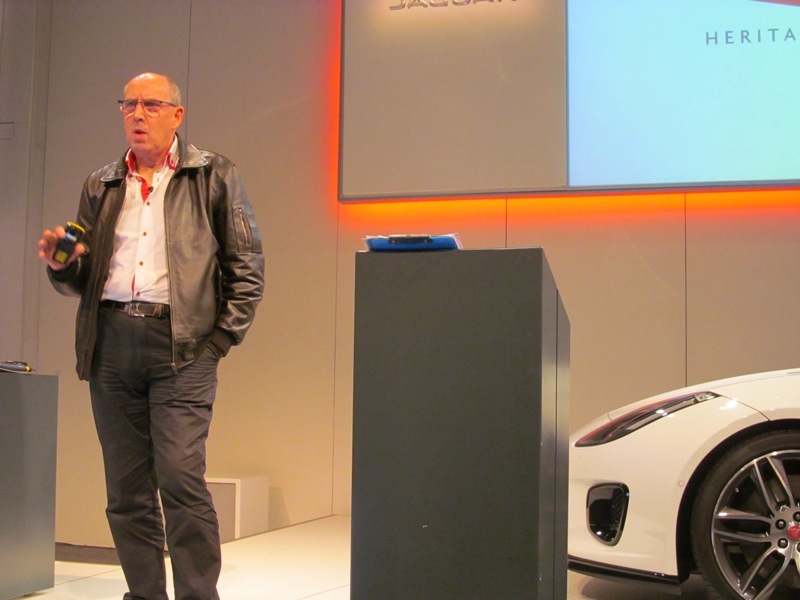 David White gave a very interesting and in-depth presentation which certainly dispelled many of the myths concerning autonomous cars! There was a lot to take in, but as I remember it, there are, according to David, 6 stages of autonomy and those he described differ from the levels of autonomy described in the various posts I found on the internet, which is interesting! How many of us realise our cars have been semi autonomous for many years and we are well on our way to fully automated cars? However there is still a long way to go to full autonomy! We are currently at level 3, and working on level 4. Level 4. Cars which can stay between given parameters, such as white lines on the road, with the driver having to take back control when things go wrong. These are the cars which currently feature in the news, usually when things have gone wrong! Level 5. Full autonomy, when the occupants are merely cargo and the car is completely in control. These are apparently a long way off as yet! David Bond (JLR Vehicle Engineering Manager) and Paul Alcock introduced us to the new 2.0 F-type, explaining that this is more of a sports car than a grand tourer, and using details written by Jim Randle and Bob Knight in 1977, as the basis for their formula, and explaining the history of Jaguar sports cars and how the new 2.0 F-type fits into their evolution. Car purchase is influenced by the image which the purchaser wishes to project of himself. Possession of a sports car implies that its owner has a “go faster” or “get ahead” personality and an interest in motor sport. Vehicle styling which implies high performance is therefore essential and it is helpful if the manufacturer has a good racing or competition record. Superior performance relative to engine size is expected. If the purchaser observes speed limits, the superiority must be primarily in respect of overtaking performance. Superiority over the sedan in respect of cornering power and steering control characteristics is expected and usually obtained. For a given performance and power unit size, lower weight and lower drag are expected to give better fuel economy. There must be a good standard of comfort, which, if combined with the second and third items, should help to reduce driving fatigue and frustration. Compliance with international legislation is obviously essential. 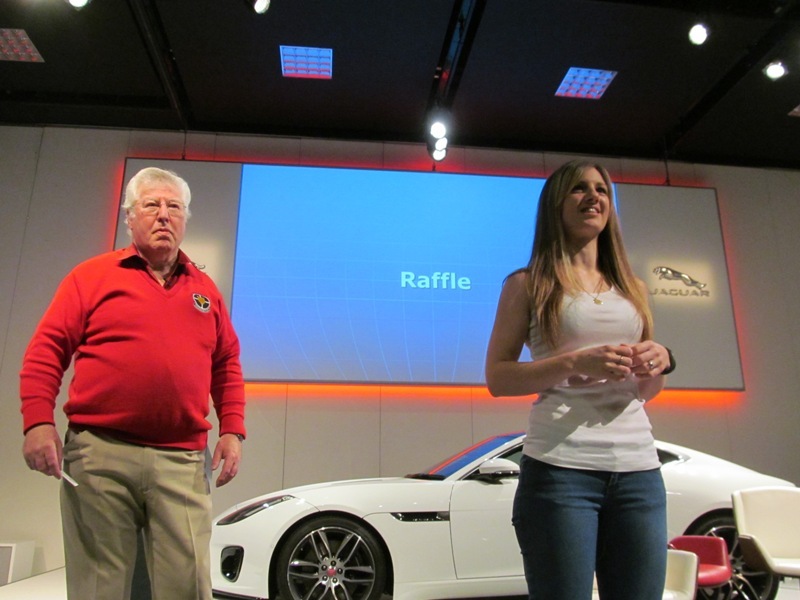 Before going on to do his own presentation on the history of The Andrew Whyte Lecture, Bob Beecham did the customary raffle draw and auction in aid of charity. 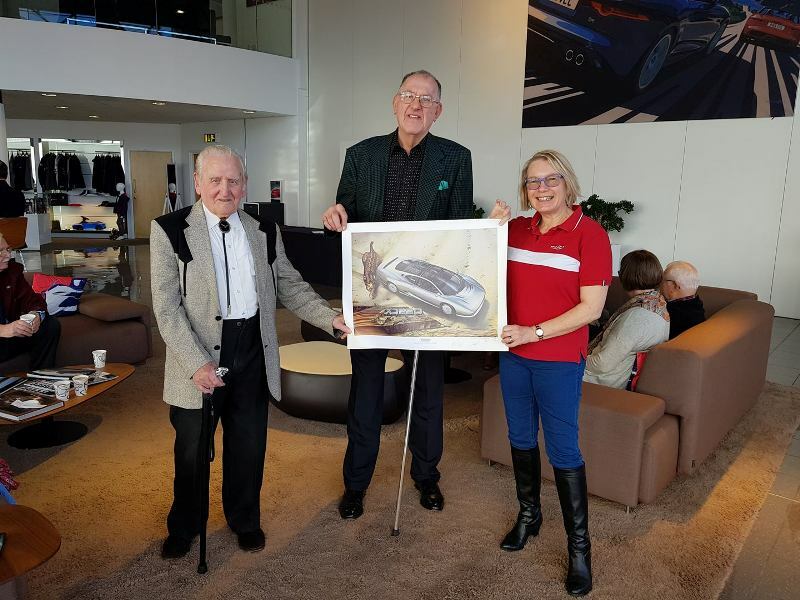 Bob then introduced Automotive Artist, Esta-jane Middling, who had donated a commission of a drawing of any car of the winner’s choice, for charity. Esta explained a little about what she does and what the winning bidder could expect. Bidding for this prize was very keen, and raised £310, the winning bidder being John Butterworth. 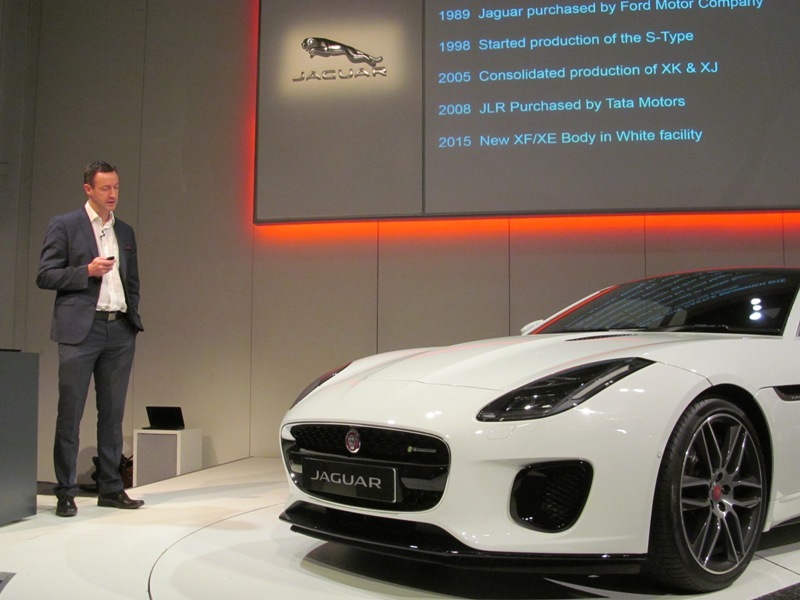 Tony Merrygold, Vehicle Collections Manager for Jaguar Heritage outlined his plans for the future of the Collections Centre at Gaydon. Beginning by introducing himself to those who had not yet met him, Tony explained that he had not come from a museum or motor industry background. 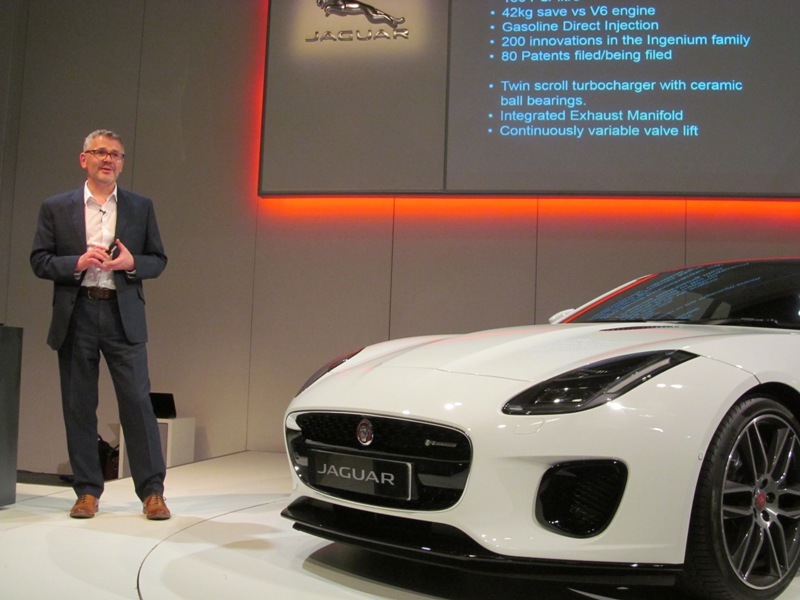 Instead, he had spent 20 years in sales and marketing at IBM followed by 20 years of running his own successful classic car hire business, which he has wound down in order to put all his efforts into his current role at Jaguar Heritage. 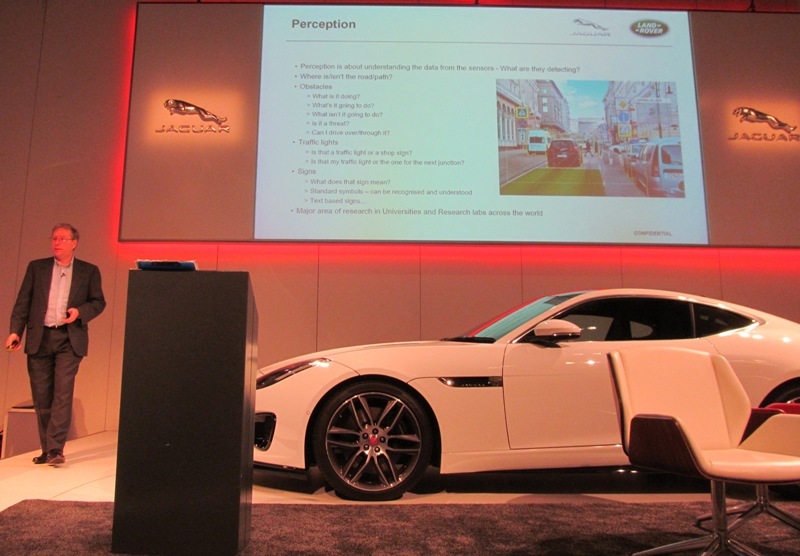 Through his presentation, Tony explained the role of Jaguar Heritage and the Collections Centre, and how he planned to develop that role and to improve the experience offered to museum visitors. 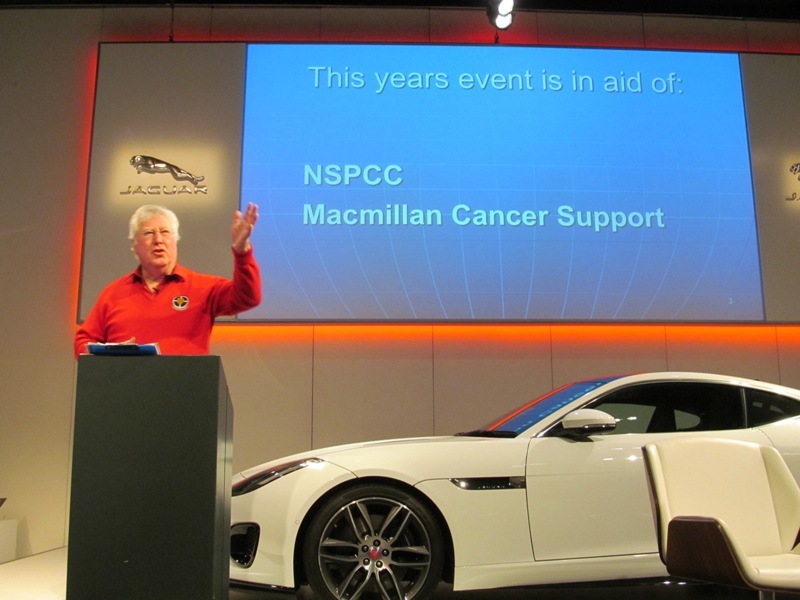 Michael Quinn, former Managing Director of RA Creamer and grandson of Sir William Lyons, founder of Jaguar Cars, was the main speaker at this year’s event. Michael did a wonderful two part presentation. The first part was on RA Creamer, the history and why the dealership had to close, which although sad, does make it clear why RA Creamer could not continue to operate from their premises in Drayson Mews, Kensington. His second presentation was even more fascinating, being a personal talk on his grandfather. Michael has a unique view and insight into Sir William Lyons and supported his talk with a series of photos – some we have seen, but many were new to the public. Michael has been invited back next year! 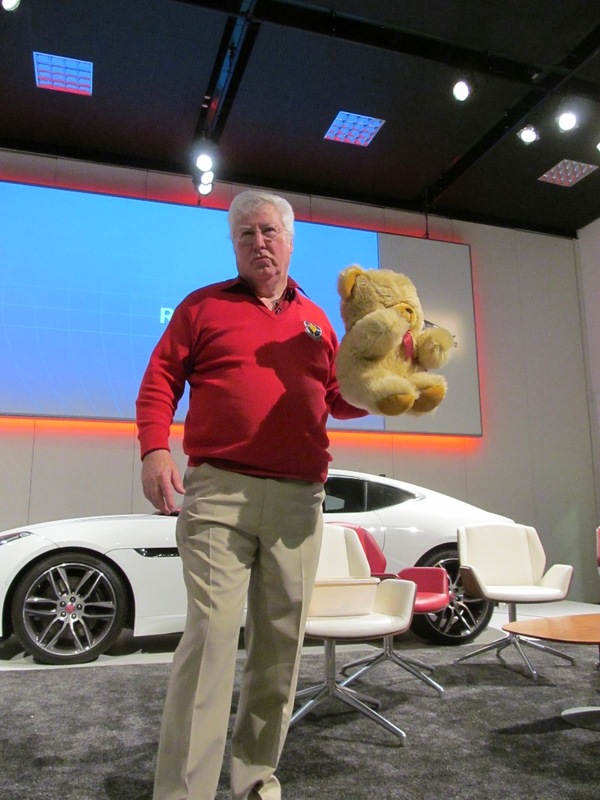 As you can imagine, there will be many family photo’s that Michael can use to highlight his talks and so these will be equally as fascinating and very important as we need to record this information before firsthand memories of the man who built Jaguar are lost. When I did manage to speak to Michael alone for a few moments at the lecture, he said the closure of RA Creamer had allowed him his first chance to spend time going through the family photo album in order to put together his presentation, which in reality, he would never have had the time to organise before, proving that there are always good things to come from what may seem a negative situation! There are currently 4 episodes – 1 and 2 are complete, 3 and 4 are previews at the moment. An email to thank you sincerely for all your help with this years AWML. It is a big help to have your support. You will also be pleased to know that John Butterworth has been in touch regarding his bid for Esta-Jane’s drawing. The money will be put to good use and on John’s request will be added to the Macmillan Cancer Support Donation. 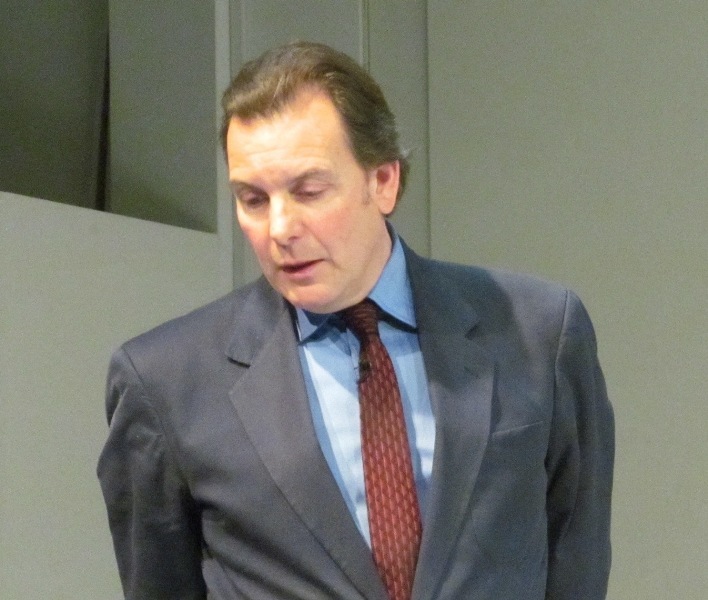 Just a quick note to let you know how much Rob and I enjoyed your presentation yesterday – I am sure you will have been inundated with similar messages – it was brilliant! Some of the pictures I have seen before, but there was enough new material to make it really interesting, and my favourite ‘new’ picture was Sir William fixing the piano! I do hope Bob books you for next year! I am delighted that you enjoyed my presentation and found it interesting.